She is unbearably excited today. Prachi Desai, the Indian television actress best known for her role as Baani in Ekta Kapoor’s family drama ‘Kasamh Se’ on Zee TV, is set to get a ticket to Bollywood. Thanks to her recent triumph in ‘Jhalak Dikhla Jaa’. Her crowning is more important for she was eliminated initially, and returned to the dance floor only through a wild card entry. However, allegations are abound that Prachi’s mentor Ekta Kapoor pulled strings to ensure her protegee’s win in the dance show. A reminder that Ekta’s father Jeetendra was one of the judges in the show accompanies the allegation. So, is her triumph isn’t entirely hers? “The judges were most fair. They gave participants the points they deserved, and even explained why. And the fact that I was eliminated is proof enough that Jeetendraji’s presence didn’t help me,” she says. Born in 1988 in Gujarat, Prachi completed her schooling from Surat. Acting was her passion since childhood. She went to Pune for higher studies and had almost finished her junior college when her pictures were sent to Balaji Telefilms and she got a call for an audition for Kasamh Se. The show is still proceeding. You can watch her. She looks very simple and doesn’t get nervous. She has also won several awards like Sansui Television Award (2007) for Best Actress, Indian Telly Couple of the Year Award (2006) for on screen chemistry with Ram Kapoor in Kasamh Se and Indian Telly Fresh New Face of the Year (Female) Award (2006). But she has to be careful. Other young entrants to Bollywood, like Neelam and Sonam, who started very early, failed to get iconic status in Bollywood. 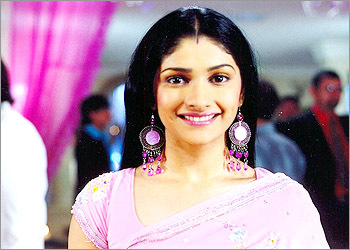 May be, because Neelam and Sonam used only one name and the new sweetie is known by her full name – Prachi Desai. You look stunning Prachi!!! Very right Fatema. Prachi was the one in million faces on TV screens; and ‘A Real Face In The Crowd’. I am waiting for her maiden Bollywood entry ‘ Rock On’. I have seen the promo, and I liked it. I am told that the sweety is set to dance away to glory with this release in which she has been cast opposite Farhan Akhtar (also debuting). Since Prachi has been replaced, I have been greatly missing her. Prachi looks great on screen. She will look greater on the big screen. Good that you have written about her. She is living up to the expectation, I believe. How do you see her growing, Ilaxi!